Aim: To compare the smear layer and debris removal in root canals instrumented with two different kinematic motions after ultrasonic and sonic irrigation activation. 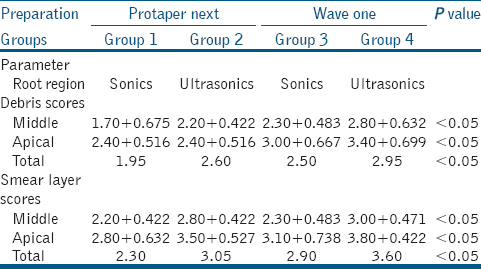 Materials and Methods: Eighty freshly extracted teeth were selected for the study and randomly divided the samples into two groups (n = 40) for instrumentation with either rotary ProTaper NEXT (PTN) or reciprocating WaveOne (WO) file systems. These (n = 40) were further divided into two groups (n = 20) where the final irrigant was activated using either Ultrasonics (Passive Ultrasonic Irrigation; PUI) or Sonics (EndoActivator; EA). Group 1: PTN + EA; Group 2: PTN + PUI; Group 3: WO + EA; and Group 4: WO + PUI. During instrumentation, a total of 4 ml of 5.25% NaOCl was used for irrigation. The final irrigation protocol included NaOCl and Smear Clear Solution. The samples were processed by scanning electron microscopic examination for debris and smear layer scoring, and statistical analysis was done. Results: The mean debris and smear layer score was less in the group instrumented by PTN with sonic activation of the irrigant. Conclusion: A combination of PTN instrumentation with sonic irrigation activation by EA is more effective in debris and smear layer removal in the groups tested. The ultimate goal of endodontic therapy is complete debridement of the entire root canal system with efficient disinfection. Shaping the canal walls creates debris and a resultant smear layer comprising organic and inorganic substances, including microorganisms and their by-products. This debris and smear layer not only prevent the penetration of root canal irrigants into the dentinal tubules but also intracanal medicaments  and sealers  that fail to effect an entire sealing of the root canal system. Therefore, it is essential to use a chemomechanical system that results in leaving the canal walls with the least amount of debris and smear layer. Recently, new generation nickel-titanium (Ni-Ti) instruments have been designed for better root canal instrumentation augering debris coronally. The Wave One (Dentsply, Maillefer) NiTi single-file system is used in reciprocating motion. The counter-clockwise engaging angle is five times the clockwise disengaging angle. ProTaper NEXT (PTN; Dentsply Tulsa Dental, Tulsa, OK) files are uniquely designed, such that the center of mass and center of rotation are offset. These instruments are manufactured with M-Wire technology, which increases flexibility and resistance to cyclic fatigue. These files tend to create a circular bore preparation irrespective of the canal shape and fail to reach buccal/lingual recesses and irregularities such as isthmi and canal fins. Such areas might harbor bacteria caused by the packed debris and result in persistent periradicular inflammation. It has been reported in literature that various irrigation activation systems might result in producing cleaner radicular dentinal walls, increasing the bond strength of canal-filling materials. Hence, this study was formulated to evaluate the debris and smear layer removal after instrumenting them with rotary/reciprocating files and activating the final irrigant with ultrasonics (PUI)/sonics (EndoActivator; EA). Group 4: WO + PUI. Specimens were instrumented by PTN files until full sequence X4 (40/.06). These files were used in outward brushing mode at 300 rpm/2.6 nm. About 3% of sodium hypochlorite and ethylenediaminetetraacetic acid (EDTA) were used as an irrigant and lubricant alternatively between each file and recapitulation. Specimens were instrumented by WO large files (40/.08) (Dentsply Maillefer, Ballaigues, Switzerland) in pecking motion, using X Smart Plus endomotor (Dentsply-Maillefer). These files were used in outward brushing mode at 300 rpm/2.6 nm. Again 3% of sodium hypochlorite and EDTA were used as an irrigant and lubricant alternatively between each file and recapitulation. After instrumentation, 2 ml of 5.25% NaOCl was used as a final irrigant for 1 min, followed by 1 ml Smear Clear solution for 1 min, followed by 2 ml of 5.25% NaOCl. Each irrigant solution was activated either sonically or ultrasonically. The EA (Dentsply, Mallifier) sonic handpiece with a size #25/0.04 taper activator tip was passively inserted to within 2 mm of the working length and used in a pumping action to move the tip for 1 min in short, 2–3 mm vertical strokes. An ultrasonic tip 20/.04 (Satellec, Acteon) was passively inserted into the canal 1 mm short of working length and driven by an ultrasonic device (Satellec, Acteon) with power set at 5 for 1 min. A final flush with 5 ml distilled water was done in all the groups and the canals were dried with paper points. To facilitate splitting of the roots, two longitudinal grooves were made with a diamond disk on the buccal and lingual surfaces. The roots were then split into two halves with a chisel, and the half containing the most visible part of the apex was conserved and coded. The specimens were dried, mounted on metallic stubs, and examined under scanning electron microscopy. Photomicrographs from the approximate center of the coronal (10 mm to the apex), middle (6 mm to the apex), and apical (2 mm to the apex) thirds of each specimen were taken at ×500 for debris and ×1500 for smear layer evaluation. The photographs were blindly evaluated by two observer's using Schäfer and Lohmann criteria. The cleanness of each canal was evaluated by means of a numeric evaluation scale as follows. Score 5: Canal wall completely covered by debris. The SEM images depicting the debris scores are presented in [Figure 1]. Score 5: A thick homogenous smear layer covering the entire canal wall. The SEM images depicting the smear layer scores are presented in [Figure 2]. Kruskal–Wallis and Mann–Whitney U-tests were used for comparison of debris and smear layer scores. Friedman and Wilcoxon signed-rank tests were used to make comparisons between the studied parameters in different canal regions. The significance level was set at P - 0.05. Statistical analysis of debris and smear layer scores for the tested groups instrumented canal walls exhibited varying amounts of remaining debris and smear layer along their entire length. The mean and standard deviation values for debris and smear layer scores are presented in [Table 1]. For the middle and apical regions and the total debris score, there were significant differences among groups. At the middle and apical regions, Group 4 showed the highest mean. There were no significant differences among Groups 1, 2, and 3; all showed lower mean scores. A comparison between root regions: Group 1 showed a lower mean score in the middle region than the apical region. In Group 2, there was no significant difference between the middle and apical regions; both showed lower mean scores. In Groups 3 and 4, the middle region had a higher mean, but the apical region showed the highest mean debris score. For the middle and apical regions and the total smear layer score, there were significant differences among groups. At the middle and apical regions, Group 4 showed the highest mean. There were no significant differences among Groups 1, 2, and 3; all showed lower mean scores. A comparison between root regions; Group 1 showed a lower mean score in the middle region than the apical region. In Group 2, the apical region showed the higher mean score. In Group 3, the middle region had a lower mean score, but the apical region showed a higher mean score. In Group 4, the middle region had a higher mean score, but the apical region showed the highest smear layer mean score. A file with an offset cross-section design, that is, the PTN affords more cross-sectional space for enhanced cutting, loading, and augering debris out of a canal. It decreases the probability of laterally compacting debris and blocking root canal system anatomy., To improve cleanliness, irrigants must be in contact with the root canal. The conventional needle irrigation technique delivers solutions no more than 0–1.1 mm beyond the needle tip., This is insufficient for complete cleaning of the intricate anatomy of the root canal system. A vapor lock, resulting in trapped air in the apical third of root canals, hinders the exchange of irrigants, and affects their debridement efficacy. Agitation with sonic and ultrasonic systems showed greater effectiveness in debris and smear layer removal. PUI creates acoustic microstreaming which produces sufficient shear stresses to dislodge debris from instrumented canals. Along the length of an activated ultrasonic file, it has multiple nodes and antinodes. Hence, PUI has been showed effective in smear layer removal., However, it also creates the undesirable dampening effect of amplitude of its characteristic nodes and antinodes pattern, especially when the instrument touched the lateral walls of a shaped canal. This may be the reason in our study; PUI was less effective in smear layer removal than EA in the apical third. Sonic activation operated with one single positive and negative node. The movement of the vibratory sonic instrument was not influenced by lateral wall contact. Similar results were also seen in other studies, showing that sonic irrigation is superior to ultrasonic irrigation activation ,, while in another study, no significant difference was found among the two. Complete cleanliness was not achieved in any of the groups. Based on the results, using the EA in canals prepared with PTN produced the cleanest canal walls. Results of the PTN system were superior to those of the WO system. Klyn SL, Kirkpatrick TC, Rutledge RE.In vitro comparisons of debris removal of the EndoActivator system, the F file, ultrasonic irrigation, and NaOCl irrigation alone after hand-rotary instrumentation in human mandibular molars. J Endod 2010;36:1367-71. Mancini M, Cerroni L. Smear layer removal and canal cleanliness using different irrigation systems (EndoActivator, EndoVac, and passive ultrasonic irrigation): Field emission scanning electron microscopic eval uation in anin vitro study. J Endod 2013;39:1456-60. Dietrich MA, Kirkpatrick TC, Yaccino JM.In vitro canal and isthmus debris removal of the self-adjusting file, K3, and WaveOne files in the mesial root of human mandibular molars. J Endod 2012;38:1140-4. Kim HC, Lee MH, Yum J, Versluis A, Lee CJ, Kim BM. Potential relationship between design of nickel-titanium rotary instruments and vertical root fracture. J Endod 2010;36:1195-9. Ruddle CJ, Machtou P, West JD. The shaping movement: Fifth-generation technology. Dent Today 2013;32:96-9. Kansal R, Rajput A, Talwar S, Roongta R, Verma M. Assessment of dentinal damage during canal preparation using reciprocating and rotary files. J Endod 2014;40:1443-6. Schäfer E, Lohmann D. Efficiency of rotary nickel-titanium FlexMaster instruments compared with stainless steel hand K-Flexofile – Part 2. Cleaning effectiveness and instrumentation results in severely curved root canals of extracted teeth. Int Endod J 2002;35:514-21. Kamel WH, Kataia EM\. Comparison of the efficacy of smear clear with and with out a canal brush in smear layer and debris removal from instrumented root canal using WaveOne versus ProTaper: A scanning electron microscopic study. J Endod 2014;40:446-50. Salman MI, Baumann MA, Hellmich M, Roggendorf MJ, Termaat S. SEM evaluation of root canal debridement with Sonicare CanalBrush irrigation. Int Endod J 2010;43:363-9. Yang G, Wu H, Zheng Y, Zhang H, Li H, Zhou X. Scanning electron microscopic evaluation of debris and smear layer remaining following use of ProTaper and Hero Shaper instruments in combination with NaOCl and EDTA irrigation. Oral Surg Oral Med Oral Pathol Oral Radiol Endod 2008;106:e63-71. Robinson JP, Lumley PJ, Cooper PR. Reciprocating root canal technique induces greater debris accumulation than a continuous rotary technique assessed by 3-dimensional micro-computed tomography. J Endod 2013;39:1067-70. Jeon IS, Spångberg LS, Yoon TC, Kazemi RB, Kum KY. Smear layer production by 3 rotary reamers with different cutting blade designs in straight root canals: A scanning electron microscopic study. Oral Surg Oral Med Oral Pathol Oral Radiol Endod 2003;96:601-7. Nair PN, Henry S, Cano V, Vera J. Microbial status of apical root canal system of human mandibular first molars with primary apical periodontitis after one-visit endodontic treatment. Oral Surg Oral Med Oral Pathol Oral Radiol Endod 2005;99:231-52. Pawar AM, Pawar SM, Pawar MG, Kokate SR. Fracture resistance of teeth instrumented by the Self-Adjusting File, ProTaper NEXT and WaveOne. J Pierre Fauchard Acad (India Section) 2014;28:83-7. Munoz HR, Camacho-Cuadra K.In vivo efficacy of three different endodontic irrigation systems for irrigant delivery to working length of mesial canals of mandibular molars. J Endod 2012;38:445-8. Khaord P, Amin A, Shah MB, Uthappa R, Raj N, Kachalia T, et al. Effectiveness of different irrigation techniques on smear layer removal in apical thirds of mesial root canals of permanent mandibular first molar: A scanning electron microscopic study. J Conserv Dent 2015;18:321-6. Plotino G, Pameijer CH, Grande NM, Somma F. Ultrasonics in endodontics: A review of the literature. J Endod 2007;33:81-95.
de Gregorio C, Estevez R, Cisneros R, Paranjpe A, Cohenca N. Efficacy of different irrigation and activation systems on the penetration of sodium hypochlorite into simulated lateral canals and up to working length: Anin vitro study. J Endod 2010;36:1216-21. Singh N, Chandra A, Tikku AP, Verma P. A comparative evaluation of different irrigation activation systems on smear layer removal from root canal: Anin vitro scanning electron microscope study. J Conserv Dent 2014;17:159-63. Jensen SA, Walker TL, Hutter JW, Nicoll BK. Comparison of the cleaning efficacy of passive sonic activation and passive ultrasonic activation after hand instrumentation in molar root canals. J Endod 1999;25:735-8.